This wall map at Sinsinawa Mound Center shows the huge impact "Father Samuel" left on southwest Wisconsin and the "tri-state area". Wisconsin is lucky to have a rich history of holy men and women. One of them is Venerable Father Samuel Mazzuchelli, O. P., a builder of Catholic churches and Catholic communities in the Southwest Wisconsin area. In addition to the river, there were bluffs to see and locks and dams (like the one, pictured above, in Alma). The kids enjoyed watching for bald eagles along the way. Note to travelers, there aren't a lot of chain restaurants on this whole pilgrimage so if you don't like eating in "Mom and Pop” restaurants, you should consider bringing some peanut butter. 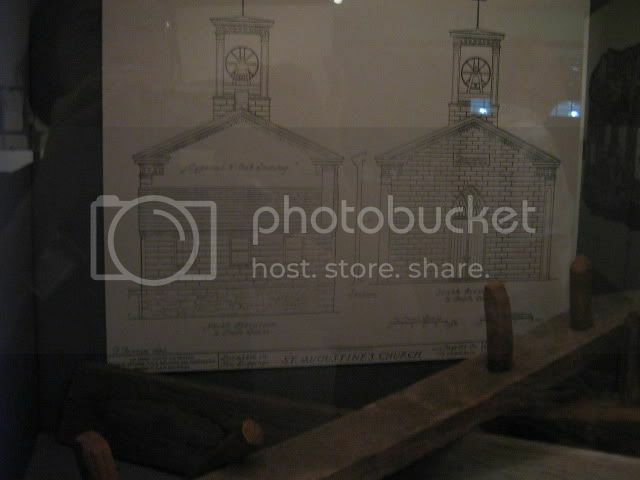 As the map at the top of the page shows, Mazzuchelli built many, many churches. Visiting all of them would be a Massive undertaking. (Get it? Massive?) I decided to set a reasonable goal of viewing his first three churches, each named after one of the archangels. Can you find the tomb on the front lawn? A picture of a picture of St. Gabriel's altar before updating. This photo can be seen at Sinsinawa Mound Center. Our first archangel church was St. Gabriel's in Prairie du Chien where a kind person from the church office next door let us in. As the sign quoted above indicates, the inside of the church was changed after Vatican II. This is a common story for churches in this area, only a few escaped "updating and improvement". Note the before and after pictures above. It makes you wonder what people were thinking. I also wonder where all those beautiful old altars went. Are they in a warehouse somewhere? Oddly-placed in the front lawn of the church is the tomb of Father Lucien Galtier, who founded the city of St. Paul, Minnesota and was pastor of this church from 1847 - 1866. We continued south on that first day spending the night in Dubuque. If you're traveling with kids, you can reward them for patiently looking at a bunch of churches all day by staying at the Grand Harbor Resort and Waterpark in Dubuque. It has a lovely view of the Mississippi River but bring your own peanut butter sandwiches because getting around in that city is a trick and cheap food is hard to come by. By the way, my children thought this was a really great indoor waterpark, and they have seen plenty. To Jesus through Mary, right? Anyone out there speak Latin? Before getting out the swimsuits, we visited another archangel church. The Cathedral of St. Raphael is tightly packed in a Dubuque neighborhood, unlike the roomy grounds of St. Gabriel's. We never managed to get into this church because it was late in the day. I have heard from John Graf, a parishioner of this church and a fellow Mazzuchelli fan, that below the rectory is a Mortuary Chapel where some bishops are buried and that it is worth a visit. "There are now 11 Catholic Churches in Dubuque. On May 25 , we lost what is probably the most beautiful church you'd find anywhere-St. Mary's [1584 White St.]. That was the only church in Dubuque that was not remodeled after the Second Vatican Council. It is still standing, "for sale." It may be made into a shrine if that can be worked out. There has been a huge community effort to save it led by the newspaper. There are several other churches in Dubuque worth visiting. There are also four Mother houses, three which welcome visitors. And Shalom Retreat Center by the Franciscans has superb stained glass. St. Luke's Methodist in Dubuque has Tiffany Stained Glass windows (a total of just under 100) they welcome visitors." Well, I missed all that good stuff but I pass it on to you for another day. We split up Friday morning. My hubby took the kids to the National Mississippi River Museum and Aquarium down the block from the hotel. This turned out to be the highlight of the trip for everyone who went. There were otters, an octopus and lots of other great stuff. They had such a good time that I didn't have to feel guilty about abandoning them to go look at more churches. St. Augustine Church is at the top of a hill in a residential neighborhood. Original plans for this building can be seen at Sinsinawa Mound Center. In this close-up you can see the wood planks painted to look like stone. First, I went to New Diggings, WI, to see St. Augustine Church. Pictures I had seen of the church before my trip were rather dull-looking so I didn't expect much. To my surprise, it was wonderful! I loved visiting this church. I had been told that while the other Mazzuchelli churches were made of stone that that wasn't possible when they built this church. So St. Augustine’s was built out of wood planks and painted or finished somehow to look like stone. It was really cool to get close up and feel the funny sandpaper-like finish and to see the chipping paint on the wood with the stones painted on it. This church is only open on Sunday afternoons so I didn't get in. I'm thinking the rope on the left side of this Mazzuchelli window rings a bell somewhere. A tad tempting . . . hmmm. How do the five-year-olds walk past that every week? I really liked this crucifix in the balcony in front of the organ pipes. It is hung with the top forward of the bottom for better view from below I guess. Jesus has bloody knees. I saw that interesting feature on several crucifixes on this trip. Then I made the short drive to Benton, WI. There were many things to see there. Above is St. Patrick's Catholic Church. A sign at the site says it was built in 1852 by Father Samuel. Mazzuchelli's gravesite is in the cemetery behind St. Patrick's. It is located next to some simple markers for sisters who died in the same era (and a gopher who peeked out of his hole and kept me company when I visited.) Interestingly, his tomb was not the biggest one there. Some more recent graves in a newer section seemed bigger and more elaborate. the Rectory Museum within, picture taken from "without"
At this site there is also the old rectory of his that has been made into a museum. As with many of the churches we stopped at, you are at the mercy of finding someone with a key to let you in and I was not so lucky. I looked at that from the outside. On my way back I made a special point to pull over to the side of the road and photograph the big metal dinosaur sculptures in the cow pasture on Highway 11. I had passed them on the way up and regretted not taking a picture. On the way up the cows were right next to the sculptures and it would've made a great shot but on the way back the cows were elsewhere in the field and otherwise occupied. I picked up the family in Dubuque and we headed west to Dyersville, Iowa. Can you find the papal umbrella in this picture? Hint: It is not white. That belongs to a wedding party that was taking pictures during our visit. This one is red and yellow. For me, there was St. Francis Xavier Basilica, out in the middle of nowhere. It wasn't a Mazzuchelli church but was worth a stop anyway. I was mad at them, though. Two special signs in a church signify that it is a basilica. A basilica is where the pope would say Mass if he came to that area. To be ready for him you need to have a special bell and a special umbrella. They were so sure that the pope would never come to Dyersville that they designed an umbrella that won't open in the way that it is required to open. I thought that was really stupid of them and part of me hopes that the pope does go to Dyersville just for spite but I suppose (and hope) the pope doesn’t have a spite-visit list. While the hubby was impressed with the basilica he was also impressed with Evers Toy Store and found some rare model car kits there. Apparently this town was a center for AMT model production in the past. If you are heading west into Iowa like we did, here is another suggestion from Mr. Graf that I did not have time to pursue but you might be interested in. "There is also a string of very ornate rural churches, (not modernized after Vatican II) located in small towns about 5-10 miles apart that would amaze you. There are about 14 starting in Bellevue, IA and ending in St. Lucas, Iowa." The basilica is actually on that route and is one of those churches. Another favorite stop on our trip was the Field of Dreams baseball field and movie setting in Dyersville. We had anticipated the opportunity and brought a bat, some balls and gloves and some sun visors so we could play on the field. I took lots of pictures of the family playing there. Heading into Illinois, we lucked into the weekend of the Great Galena Balloon Race and watched an evening balloon ascension. If the rest of my family had gone with me to see the third archangel church in Galena, Illinois instead of staying in a hotel room and watching SpongeBob, they would have been wildly impressed with the town. It was home to Ulysses S. Grant, whose house you can visit, and is a beautiful, hilly, tourist/resort town. St. Michael's Catholic Church, founded in 1832, is in a tightly packed part of Galena. My daughter and I did find someone to let us in and were able to admire an unusual side altar to St. Therese, Little Flower (above). In the back of the church was a steep hill covered with unmowed grass. They had placed a crucifix on the hill. There was also a statue of the Blessed Mother up high and at the bottom of the hill a statue of St. Bernadette looking up at her. 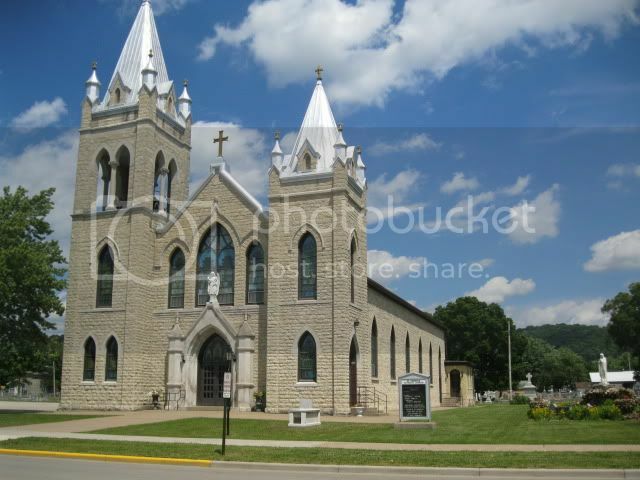 St. Mary Church in Galena is also a Mazzuchelli church in that he planned its construction. I didn't visit it but you might want to. We, then, all packed up and drove a short way back into Wisconsin to Sinsinawa Mound Center. We went to the museum and saw Mazzuchelli's prayer chain, which I had wanted to see. We saw a lot of art and went to the gift shop. They had two labyrinths, one indoor and one outdoor. I had never seen a labyrinth and wondered what it would be like. Some of us took off our shoes and walked the indoor one. Since I couldn't figure out the mathematical routes it took, I found it fascinating. You would walk these lines thinking you would know where you would be going and then end up in a totally different part of the circle. Before leaving we all went out and walked the outdoor labyrinth too. The children found this at least mildly interesting. On the way to our hotel room in Onalaska, WI, we visited the Dickeyville Grotto. It was kind of neat. There were so many different kinds of rock in so many different colors. I liked being able to touch it. We were hungry and our only option for food in Dickeyville was at the bowling alley so we moved on. We found a Happy Joe’s Pizza in Lancaster and had a lovely meal complete with ice cream. The last stop of our trip was the National Eagle Center in Wabasha, Minnesota. We liked seeing the eagles that live there. Maybe because of the time of the year, we weren't successful in seeing any eagles in the wild on this trip. If you plan to go, you might want to avoid the eagle feeding show on Sundays. That is “rat day”. I think “fish day" might not have been so graphic. It was a fun stop though. Then we headed home, ending our pilgrimage. Three kids, four days, four states. This statue of Father Mazzuchelli can be seen at St. Patrick Church in Benton. Spirit live and reign one God, world without end. Good-bye from my gopher friend.